Hypertension, or high blood pressure, occurs when pressure in the arteries is too high. Most of the time, there are no symptoms of hypertension, even if it’s really high. However, some examples of symptoms that someone may experience are headaches, shortness of breath, and palpitations. High blood pressure is concerning even if someone is not having any symptoms. If hypertension is uncontrolled over a long period of time, it can lead to many other medical issues such as heart disease, stroke, and chronic kidney disease or failure. Hypertension is a multifactorial disease, meaning it’s not caused by one thing alone; genetics, lifestyle, and environment all contribute to risks and manifestations of the disease. 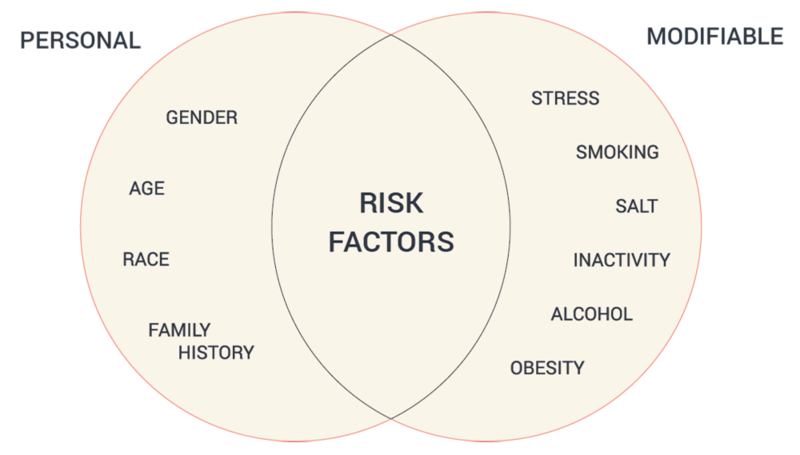 Certain personal factors can influence your risk for hypertension, such as age, race, gender, and family history. There are many other modifiable factors as well, including tobacco use, salt intake, inactivity, alcohol use, obesity, and of course stress. Hypertension itself is considered a modifiable risk factor for other diseases. It’s considered the most modifiable risk factor for all mortality, after cigarette smoking. This means that if you can maintain a healthy blood pressure, you can prevent many other dangerous health concerns.